Lab setup: The dots (QD1 and QD2) are excited and then their output photons are routed simultaneously to a beamsplitter in which coalescence can be observed. PFC-supported scientists have devised a new method that could be used to generate multiple pairs of “indistinguishable” photons – near-identical individual quanta of light – by fine-tuning the output from two separate quantum dots. Manipulating single photons will play a role in any eventual quantum communications network or quantum computer, and characterizing the behavior of single-photon sources is a subject of intense interest worldwide. Moreover, many planned applications call for multiple single photons that are virtually identical, with exactly the same frequency, spatial and temporal extent, direction and polarization. The diagnostic hallmark of indistinguishable photons is a peculiar property: When they are aimed at different sides of a 50-50 beamsplitter, both photons invariably emerge in the same direction. That is, they “coalesce” into a two-photon collective state. Until now, such indistinguishable photons had never been produced by separate quantum dots. 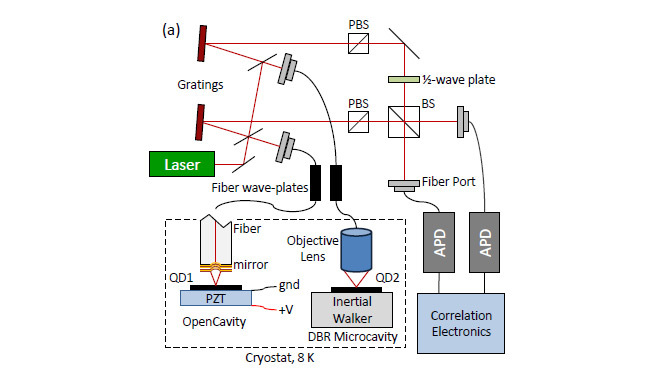 The researchers achieved their result by tuning one of the dots (QD1 at left) using a piezoelectric transducer (PZT) that stretched the dot, thus altering its atomic spacing and, therefore, the wavelength of the photons it emits. That technique allowed them to generate photons indistinguishable from those emitted by QD2. The coalescence rate was about 18% for this initial proof of principle. The scientists expect to raise that rate substantially in subsequent experiments.